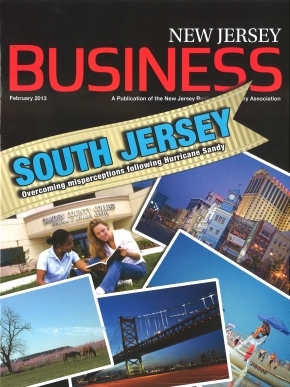 Whitesell is proud to announce our organization’s energy efficiency efforts were recently featured in the article, “Upgrading Your Indoor Environment,” appearing in the February issue of New Jersey Business Magazine. 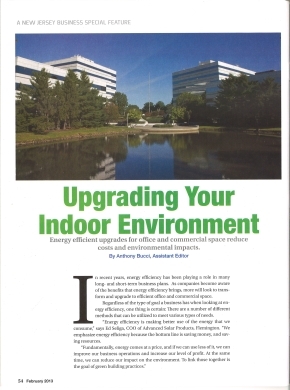 The article, written by Anthony Bucci, discusses recent energy efficient upgrades in commercial office and industrial environments and subsequent positive effects to building operating costs and the environment. Companies interviewed in the article included Constellation Energy, Advanced Solar Products, MaxLite, MaGrann Associates, and Whitesell. James Whitesell, VP / Leasing & Marketing and James McCullough, VP / Property Management cited recent examples of Whitesell investments into upgraded HVAC environments, installation of Thermoplastic TPO mechanically fastened roofing systems, and warehouse “daylighting”. The energy efficiency upgrades have enabled tenants to enjoy lower operating expenses while reducing the impact on available resources by consuming less energy.